The following diagrams break the eye up into different parts to show the various places you can apply eyeshadow. It is really useful to know the different parts of the eye where you can place eyeshadow. You can create a multitude of different looks by using different eyeshadow placement combinations. You can keep eyeshadow very simple and apply only a lid and highlight colour. Alternatively, you can experiment with applying shades to various places to create different types of looks. The two diagrams below (with coloured key table) show the various parts of the eye. 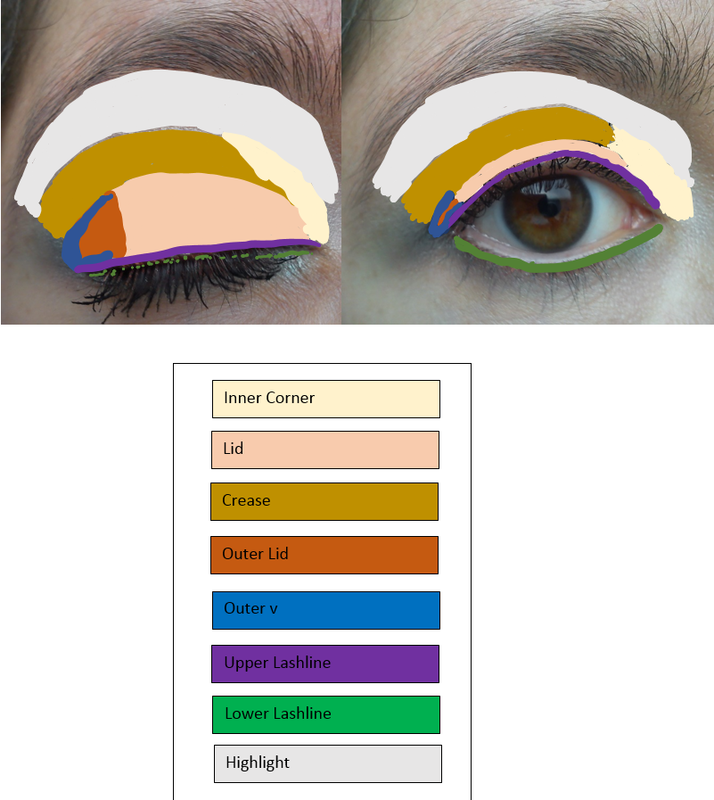 The two photos at the end of this article show a made-up eye which has eyeshadow and eyeliner applied to the places indicated in the first two diagrams. You can use these diagrams in conjunction with the looks on this site to see exactly where to place your colours.